Bottom line, this book was crazy inventive and a really fun idea. The snark, the feminism – all great! I am very curious to see if the Lady Janies put their heads together again and if so, what chapter of history will they revise? I’d definitely read another book from them, but My Lady Jane I don’t need to read again. 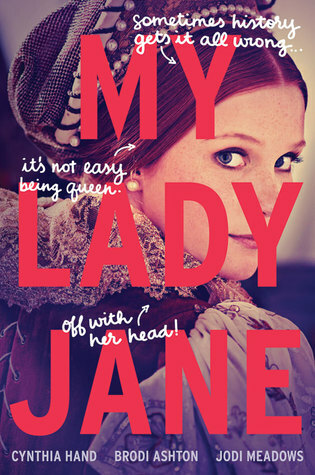 Again, I’m finding myself a black sheep on this book so if you like the concept definitely give My Lady Jane a try. While it is a long book at 500 pgs it flew to read. I have to say as a teen I think I’d have loved this – maybe I’m getting too old for YA? Don’t answer that! Have you read My Lady Jane? Did you swoon over G? Is there a time we get too old for YA? I weep at the thought! Thank you HarperTeen and Edelweiss for this advance copy in exchange for an honest review! Basically I’m still book hungover from reading Sweetbitter last week – I’m trying to find the words to review it soon. In the meantime I’m trying to get over feeling I was lost in New York in Sweetbitter by throwing myself into Celtic lore in The Last Days of Magic and maybe imperial Russia in The Crown’s Game. I’m also going between smutty romance in Washington DC in Sustained and even Charlotte Bronte’s Fiery Heart. While I’m trying to do justice to my new obsession here are quick reviews of two new YA series I enjoyed. In the interest of full disclosure I haven’t read A Tale of Two Cities – but I was so intrigued by the idea of a Dickensian retelling I had to request this book. Lucie is a child of the two cities – one light magic and one dark. She’s in love with a boy – both light and dark. I’m all for young love but the way this relationship was treated was a bit much for me. I know teen relationships are intense and have real feelings – but really they are teen relationships and I just don’t get it when they’re treated as adults by adults. That being said Lucie and Ethan were sweet – but his dark side is where the promise was! This felt like a mash-up of urban fantasy and dystopian and I am very curious about whether it will stick more in one genre in the future. I was really impressed with the depth of the emotion I felt in the end of this book. I was nearly in tears as things played out between light and dark. I will definitely continue with this series – I just have to make sure I read some Dickens before this sequel comes out! Dragons and ogres and witches – Oh my! 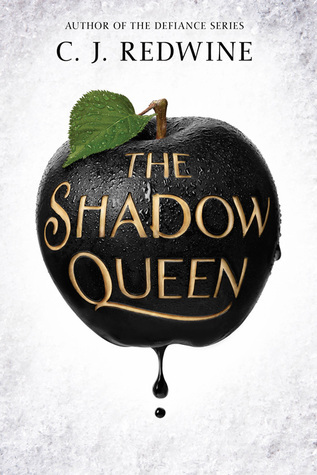 When you see that cover you know this is going to be a creepy version of Snow White. This evil queen and her apples were deliciously rotten. I would have enjoyed some deeper world building – when did magic become such an issue in Ravenspire? Why are the ogres attacking Eldr? But my curiosity was piqued and I stuck with the book. I really liked Lorelai. She was brave and loyal and definitely kicked some booty. Kol grows up quickly from a party boy to a king and I loved his dragon side! I want more dragon books! Again, the evil queen was just fantastically evil. I think she could have been deeper – but overall this was a great light read. I flew through the Shadow Queen. I hope the next Ravenspire book follows the story to Eldr for this dragon – ogre business to be resolved. Basically all the dragons for me! Thank you Clarion Books and NetGalley and Balzer + Bray and Edelweiss for these advance copies in exchange for an honest opinion! Magic moonshine? Who could pass that drink up? Ok, I might now after reading this strange little book. But given the chance at a magical drink as a teen? What a premise this book gives! I read Down With the Shine in a day – I had to fly through it to see how this mixture of YA, grit lit, and magical realism could turn out. I have to say that I was surprised and entertained all throughout. Lennie knows that her uncles brew moonshine. She knows there is a family ritual that offers a wish to go with drinking the first sip, but she doesn’t know that her uncles are really granting wishes. So when she takes jars of shine and crashes the party of year and makes a wish for everyone who asks – let’s just say she wakes up to all kinds of messes the next day. I liked Lennie. She started out pretty sad and morose, but she grew quite a spine in the end. She has a pretty rough awakening to the wish granting business and I liked how she owned up to her mistakes. I really was amused by her uncles and I wish there had been more time with them. I would have liked to have learned the secrets to a successful moonshine/wish granting lifestyle! The description of the book should make it clear that Down With The Shine isn’t a book to take too seriously – with literal balls of steel and all – but it seemed to take things a little too lightly at times. This started like it was going to be a very dark – Lennie is a social pariah after the murder of her best friend. But then after the party the feeling changed pretty rapidly which took me a minute to get used to. I think the elements of darkness in Lennie’s life just didn’t balance with the silliness for me. It was hard to go from feeling sorry for Lennie due to her murderous father, spaced out mother, and overall loneliness to laughing at those balls of steel or teenage boys with working wings. I like dark humor – I just needed the darkness and humor to meld more overall. Had there been more depth all around I think this could have gone from a fun and fast book to a really great book. However, I thought the ending was clever and tied things up just right. Not at all what I expected! Definitely one to try when you want to laugh and are ok with some gross along with it. I’m soon going to have to revise my feelings on reading YA contemporaries if I continue to get so lucky with my reading choices. Generally if I’m reading something contemporary I want adult but I kept seeing buzz about The Serpent King on Twitter – thanks to Eric Smith in particular – I was convinced to request a copy. The Serpent King joins some other excellent YA reads like All the Rage, Made You Up and Dumplin’. This book had me smiling and then crying within pages. Dill, Lydia and Travis stand out from the other kids in their small Tennessee town, and though they are none too alike themselves they are the best of friends. Lydia has a popular fashion blog and supportive family that have her ready to head to New York for college, Travis has a Game of Thrones-like fantasy world to escape to and an online community for friendship. Then there’s Dill; Dill has to visit his father in prison and a plan to go full time at the local grocery store after graduation. Dill’s father was a snake handling preacher before he was sent to prison on the worst of charges and he and Dill’s mom- along with nearly everyone else- blames Dill for his sentencing. The Serpent King begins as these friends are starting their senior year of high school both with dread and an eagerness to be done. Zentner’s excellent storytelling put me right into a cruel high school experience in rural Tennessee. I cringed as Dill and Lydia approached the parking lot each day. But he wrote this beautiful friendship as well so the terrible was balanced with humor. I loved how Zentner took the story right up to the edge of hopelessness and then showed how brave you have to be to move forward. These three friends made me cry and they made me hope. As a side note, absent or terrible parents are par for the course in YA, which made Lydia’s amazing parents stand out all the more. I loved them! Even if they were a bit over the top, it felt good to read about a real and loving parent-child relationship; especially to hold up against the other parents in this book. This book was all of those things – painful, brave and beautiful. Read it! Thank you Crown Books for Young Readers and NetGalley for this advance edition in exchange for an honest opinion! Quotes taken from unedited copy in advance of publication. I’m so sad to say that Into the Dim was, well in a word, dim. When I first read that this book involved a secret society in Scotland and time travel I was ready to eager to dive in. A book about a smart girl going back eight centuries to find her mom – awesome. Unfortunately I found Into the Dim to be pretty flat and predictable rather than the romantic adventure it was supposed to be. Hope could have been amazing! Instead she was really pretty disappointing. For all that she was supposed to be so smart with her photographic memory she surely missed all the clues I saw dropping. Honestly, I love a good plot twist as much as the next girl – but don’t give me a genius main character who can’t see a setup as it’s happening. None of the characters had much depth to them unfortunately so Hope had nothing to be propped up with besides the time travel. I liked the idea of the travelers moving throughout history and preventing others from messing with treasures that might otherwise be lost to history – but again the execution was just off. I think if Taylor had kept the time travel simpler rather than adding complicated machinery to lay lines it would have been better. Don’t make the reader think too hard about the implausibility of your story – just go with it and I will follow you! Where Taylor’s work shone through was in the research. You can tell she really loves the time period and Eleanor of Aquitaine. When Hope lands in the past Taylor really brought the scene to life. The smells and the dress, the class distinctions and the royal pageantry were all so well done. But still, Hope and her companions felt too wrong footed for all the research and experience they were supposed to have. The research just wasn’t enough to carry the book. Thank you HMH Books for Young Readers and NetGalley for this advance copy in exchange for an honest opinion. Clearly I have a thing for fairy tale retellings so when this Rapunzel story crossed my path I had to read it. Luna is no Disney princess. She can handle a frying pan, but is definitely more a sword kind of girl. Luna lives in a world that has gone dark. There are just a few hours of light in the day and there are some seriously creepy nasty things called dwellers that come out in night. I want to know more about the dwellers! They were scary – but where did they come from? They’re a threat throughout the book but I never felt like I had enough explanation. I really hope that Jordan gives some more explanation in the series. Luna lives safely in a tower with her guardians. Her royal parents were murdered at the time the darkness began and no one knows she survived. When Luna leaves her safe haven to rescue Fowler and her friends life as she knows it is changed forever. The eventual romance moved maybe a bit fast, but I still liked Fowler! He’s grumpy and he’s haunted by his own past, but he really at heart is a better person than he lets on. I really liked them as a couple and I thought they were balancing for each other as the story went on. Was it a tad predictable in some places – yes. But this was still a really fun and fast read. Jordan left off with a killer cliffhanger ending and I will be really looking forward to the sequel! I hope Luna turns into an amazing queen! Thank you Harper Teen and Edelweiss for this advance copy in exchange for an honest review! I’ve been harsh on my young adult reading so far this year! Well this was the first bust for my 2016 TBR Challenge. I am not 100% sure how I ended up with Born Wicked on my list to read – I must have been in a witchy phase and I had heard good things about this series. I read about 100 pages about Cate and her worries about hiding the magic she shares with her sister and I realized – I just wasn’t going to care what happened. Cate learns she and her sisters might be the witches in an ominous prophecy – that had potential. But then another trio of sisters begins to be arrested. Why did it take 16 years for that to happen? When I start nitpicking at plot details I know its time to just stop. I’m replacing this book on my TBR Challenge List with The Book of Unknown Americans by Cristina Henriquez (not at all alike but oh well!). I had so much hope for Wilhemina! An orphaned teenage queen trying claim her land and save her people from treacherous conquerors? Sign me up. But when Wil and her faithful friend sneak into the palace and she maneuvers herself into a meeting with the evil king – where he so conveniently gives her all kinds of important details? No thank you. Things were starting to feel a bit too predictable of where a knife might end up right in Wil’s back. Another series off the list! Harry Potter meets Twilight in debut novelist Lori Goldstein’s magical tale of sixteen-year-old Azra, a teenage girl whose Jinn ancestry transforms her into a modern-day genie. With the power to grant anyone’s wish but her own, Azra pretends to be human, spending her days at the beach, enjoying a budding romance, and evading her Jinn destiny. But when she discovers she may not be like the rest of her circle of Jinn, will her powers save or endanger them all? Azra wakes up on her 16th birthday in an entirely new beautiful body – give me my first eyeroll. Why can’t Azra save the world in her shorter body without perfect curves? Azra doesn’t want to be a jinn, but knows she can’t change anything. That doesn’t stop her from doing a lot of whining to her mother and to herself about the path ahead of her. As her mother has been Azra is part of a circle of Jinn all coming of age together. So we have a group of mean girls basically with Azra as the odd one out who doesn’t want her powers. It felt like all Azra was doing was taking her new powers for granted, not learning what she could be doing and then whining some more. I’m out. I hated to give up at the end of a trilogy! I enjoyed the first two books in this series enough, but I think in part I’m just at the end of my dystopian rope. I wanted to know what happened to Day and June but I also found the language to be a bit ridiculous. I couldn’t picture Day talking the way he was written and I couldn’t keep reading. I am still eager to pick up Lu’s new series and start The Young Elites! Thankfully I’ve read two recent YA books that I LOVED and have to review soon so be on the lookout for those!